Q. That was a very demanding match today. How pleased were you to come through it? RAFAEL NADAL: Well, for sure is a fantastic victory for me against a very difficult opponent. So is a dream for me be in the final here another time in Monte Carlo. Start the clay court season being in the final is very good for me, no? Everything is positive on the result. On the game, hmm, I think I played too short for a lot of moments. I think I had few more mistakes than usual, especially at the second set. That's true. I was a little bit unlucky at the second because I had lot of breakpoints in the 2 1 for 2 All. He played very aggressive. All the first serves was inside. Very difficult to do. I really only had one good chance and I had big mistake with the backhand into the net. After that I felt a little bit tired. I had to win the next game. With 3 1, I had 40 15. Was a terrible mistake from me lose that game. Because with 3 2 I think he was tired, too. I was there; I had chances in almost every game when I was returning. It was a big mistake for me in that moment. Q. Going into the third set, what were you wanting to adjust? RAFAEL NADAL: I think he had few mistakes. But I play more aggressive. That's true, no? I play a little bit more inside the court, open a little bit more the court, change directions. Against him is very difficult. Sometimes he play two meters behind. Is difficult to win the point, no? When you are playing shot, shot, sometimes you feel after five shots you are the same place than the beginning. When it happen, is not a good new because finally you play short and he has a fantastic cross backhand. I had to change something. Probably he was a little bit more tired in the third, too. I was tired, too. So I think I played a little bit more aggressive. I changed a little bit more the directions. That was the most important thing. Q. 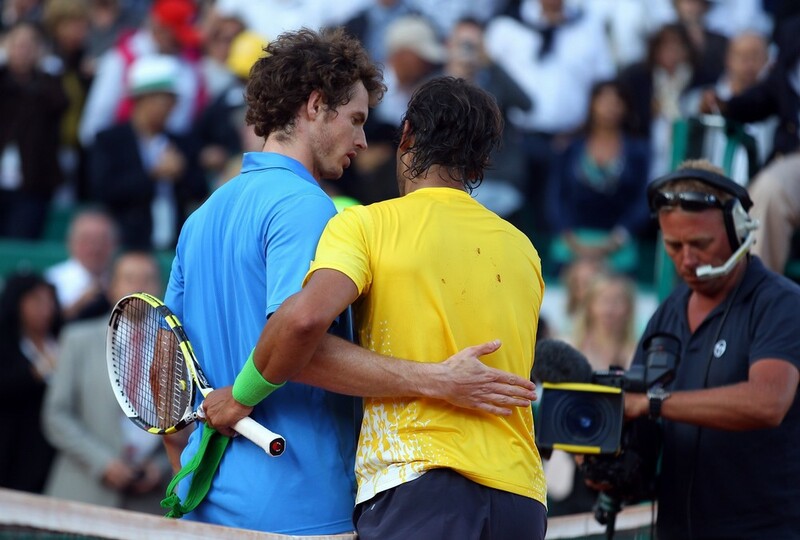 The start of the match was a bit weird because it was delayed because of Andy's elbow injury. How did you adapt to it? Q. You said sometimes there were five shots and it was right back where you started. That's usually how opponents feel when they play you. You felt today Murray was getting you into uncomfortable positions? RAFAEL NADAL: I helped him I think a little bit. My shot wasn't enough good a lot of times with the forehand. He had the chance to come back on the point a lot of times. I think I did better the end of the match. Especially the last game, 5 1, I played like I would love to play, because I changed directions, I played well with the forehand, longer, closer to the lines. That's what I have to do if I want to have chances tomorrow and during the rest of the clay court season, no? If not, for sure I am competitive, I can win, but will have a lot of very tough matches. Q. Is Andy a much different player now than when you played that match against him a couple of years ago in the semifinals? RAFAEL NADAL: Yeah, probably I think he had a very bad American hard court season, so he knows he can't have a lot of more mistakes. So for that reason, if he wants to be in the top, because he started the season fantastic, but is dangerous when you start to lose matches during the season. So he has unbelievable potential. He's very good in all the surfaces. There's no reason why he cannot play very well on clay because his serve is good, his movements are very good, and his shots are with topspin. He has a very good control with the shots. Very good backhand, too. There's no reason why. I think he going to play very well on clay, for sure. He knows that. He's for sure hungry another time to win. That's why he was in semifinals without losing games. That's why today he was close to the victory, no? Q. When you play best of three, if you lose the second set, you always win easily the third set, 6 Love, 6 1, sometimes 6 2. That means you are so much stronger physically than all the others. That helps you to grow the confidence for best of five sets in Roland Garros? RAFAEL NADAL: Well, is for sure easier to win matches in best of five than best of three. Is only for one reason: because the best players have better chances in the best of five than best of three. Normally the best of three you have one mistake, you lose your serve, you are in trouble for the set. If you lose one set, you're under pressure the best of the match. You play best of five, you have time to come back. Q. Especially if you're stronger physically. RAFAEL NADAL: I think everybody is strong physically on the tour. I am strong. I think so. I think Andy is strong physically. David Ferrer is unbelievable physically. Federer is unbelievable physically. Djokovic. Everybody. Not only the top players; everybody practice every day two hours, three hours, practice physical performance. So is impossible not be fit. Probably the mental part affects a lot much more than the physical part sometimes, no? Q. Before the beginning of the match, did the ATP ask you if you agreed to wait? RAFAEL NADAL: No, I didn't have that choice. But anyway, if I had the choice, for sure I will say yes. I don't know exactly the rules, but is. I don't know the rules. Sometimes with 15 minutes. Was an exception. Good exception, because for the crowd was a good match, I think. Q. A word on David Ferrer tomorrow. RAFAEL NADAL: In the final winning easy all the matches. He had a fantastic start of the season. He didn't lose yet on clay yet this year. He won in Acapulco and is in the final here. He beat me in Australia. He's very dangerous, no? Very difficult match going to be. I have to play very well. I gonna try.